Domestic money market continued to experience liquidity pressures in October as Repo WACR differential turned negative with (-)3 bps. 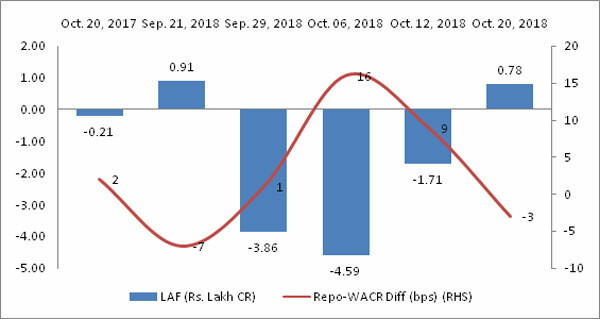 It is noted that the liquidity condition in the banking system has worsened with the fall in Repo-WACR differential to a negative territory. Growth in credit offtake has further accelerated to 14.36% in last week of October. Growth in deposit, on the other hand, slowed down to 8.87%. It is noted that the offtake is expected to expand faster till December due to festive season. Liquidity condition is expected to improve marginally in the next weeks as RBI is set to infuse another Rs. 400 billion in November (first week). 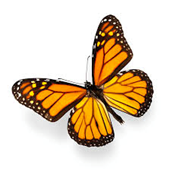 Further infusions are expected in the rest of the financial year to maintain stability. Capital market seems to be stable; spread between 10-year Indian G-Sec bond and 10-year US bond is recorded at around 480 bps in the last week of October. The spread was only 457 bps a year earlier. Therefore, the market for Indian debt remains more attractive (for foreign portfolio managers) in FY19 as compared to the previous year. On account of higher yield, commercial bond issuances have dropped by (-) 29.46% in September, 2018 on a MoM basis. With the RBI’s intervention, the USD-INR pair remains stable at 73.4. It is worth mentioning that RBI has sold its forex reserve of around $8 billion in one month to reduce the currency volatility. Global currency market is expected to remain highly volatile inthe last week of October as the 7th US Federal Open Market Committee (FOMC) meeting (due on 7-8th November, 2018) is around the corner.